We've loved the school holidays so far. The waking up late. The late nights. The chocolate. Don't forget the chocolate. Got the BEST EVER Easter Egg from Daddy this year. That picture doesn't actually do it justice. It's huge and tastes like a Ferrero Rocher (minus the gooey stuff). It's so rich I have only just finished it today. A small square at a time, pinched from the fridge satisfies you. It's amazing. But our favourite thing has been spending time with cousins. We even got to see a private screening of Robinson Crusoe which hasn't even come out yet. Go us! The kids sat at the front on leather bean bags and I was in the front row breastfeeding my lil lady, except I had to keep sitting her up and facing her round. 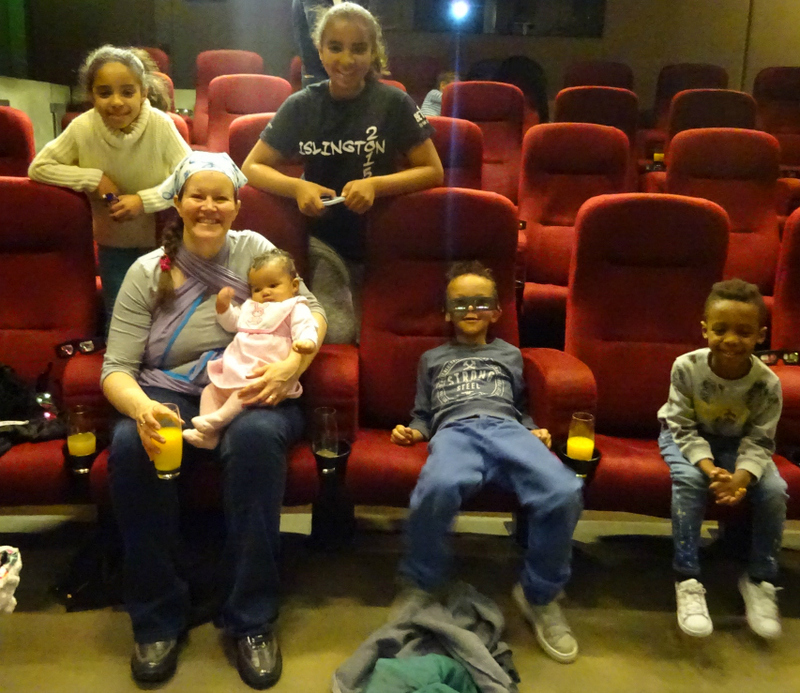 At a tender 9 weeks she actually wanted to see the film and watched a large proportion of it. I was amazed. 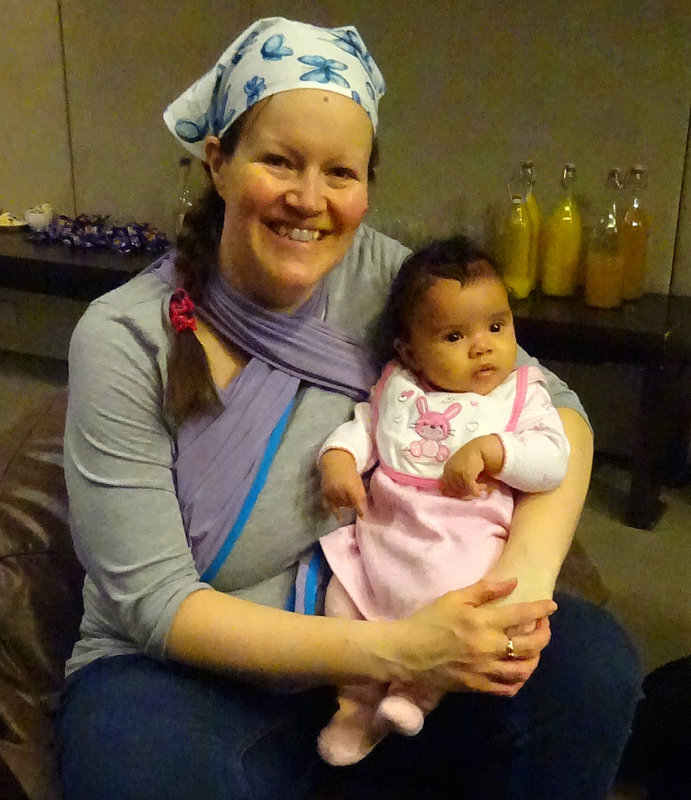 It was lovely to see Berice Baby there. She even got a pic of me and baby which is incredibly rare as I'm always behind the camera. I've just realised I should have returned the favour. Baby brain I did not even think of it. London Underground and a big buggy was no problem whatsoever with my little people to help. Plus they all kept the lil lady entertained whenever she wasn't feeding or sleeping. Back to the film though. They all loved it and apart from popping to the table for a drink or snack they didn't move, totally riveted. I asked them all afterwards, what did they think and they all talked at once such was their enthusiasm to share how much they loved the movie. In terms of ages we had 5, 8, and 12 years of age and me in my 40s. We ALL loved it. Length - when a film is GREAT you're gutted when it ends all too soon. This is a wonderful 90 minutes and the time does not drag! Colours - oh it was like every single screen throughout the movie was a picture on Pinterest or Instagram, so rich were the colours. What I loved even more was the detail. On the cast you could see every hair/feather and given it was 3D the detail was quite literally in your face. I loved it. There was one scene where the screen was covered in water and rocks and I literally felt as if I was there! Pace - there's a chase of bad guys after good guys at one point and it is superb. The kids all talked about it after we left the screening. It was better than anything I've ever seen in an adult action movie. I won't say more in case it's a spoiler but it's certainly one of the highlights of the film and I love the PACE of it and how it gets you on the edge of your seat! 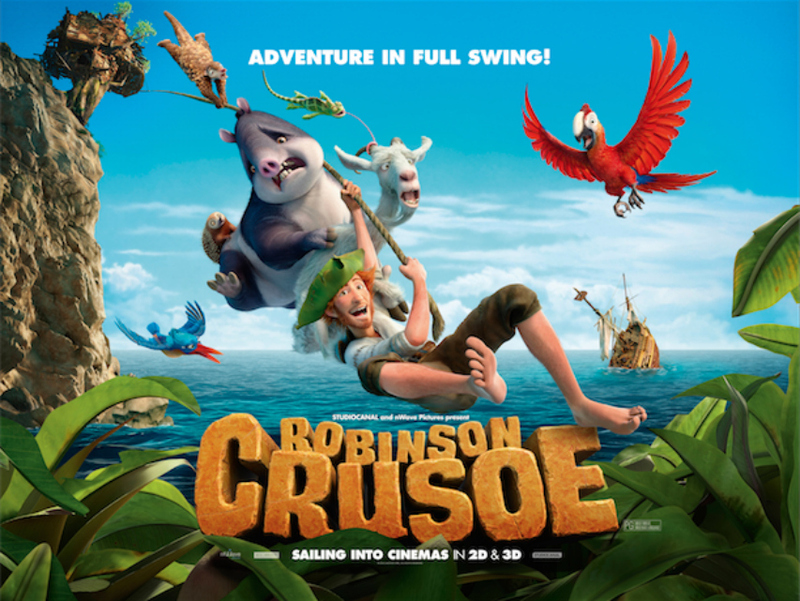 Plot - Robinson Crusoe is a story that all parents will already know, but don't let that stop you going. None of the kids had heard of it, so they went in fully curious and I wasn't disappointed as it is a fully fresh take on the film. 3D - the movie is 3D which really adds to the great animation and the cinematography. Yes it means you have the hassle of wearing glasses but it is well worth it. Character development - like any great film, this film goes a long way to fully developing the characters so that you go through the highs and lows with them. We all had different favourites as there's a character for everyone. Literally no two favourites the same. Aaron LOVED the chameleon Carmello. My nieces loved the parrot and the pretty bird. I think my favourite was the hedgehog! All the way through the film everyone is talking but actually the animals don't understand "human" but yet they do so much together including building an amazing habitation out of wood - I won't spoil it by saying more. 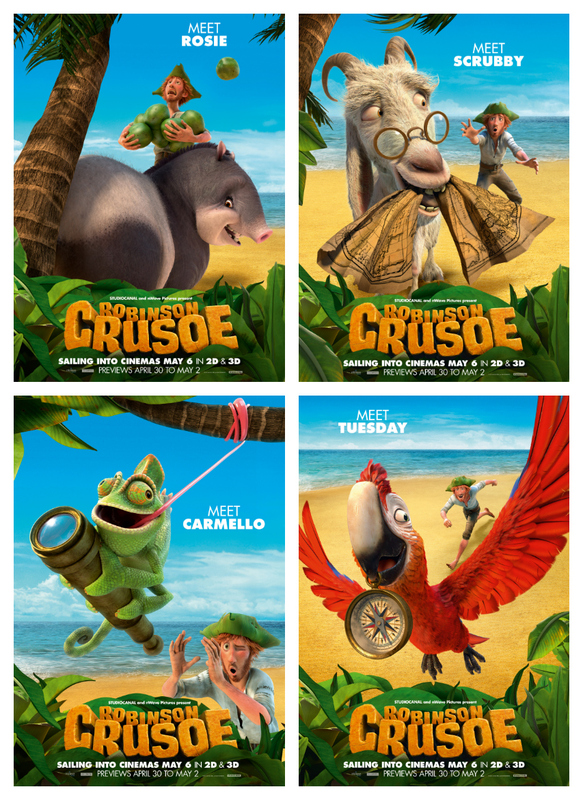 Heroes - should be Robinson Crusoe himself but the parrot (Tuesday) and pretty bird (can't remember her name) are good contestors too. USP - this film is FULL of animals, and their quirky mannerisms! So if anyone in the family is an animal lover you will be enthralled and if you aren't a lover of animals already you will be by the time the film finishes. Lovable - there's lots to love in this film. Robinson himself is a bit hapless and clumsy. Literally you get the message that he couldn't survive without his furry feathered Island neighbours and there's a message there, that life is better with friends. There's a great philosophy in this film that you can do things despite the odds and that cooperation works wonders, despite your differences and reservations. Villains - two ferocious cats, also known as ratters from their days on the ship! Now cartoons and films nearly always have "bad guys" and sometimes they can be so scary they stop your children enjoying the film. That's not the case here. But you do find yourself loving to hate them. They are evil bad guys and then they even have kittens, as they are a couple, so there's EVEN more of them! Tttsssk! It's good for a moral message as they provide the character traits that you want your kids NOT to exhibit and this film backs that up. You don't want to be mean like THEM! 8 year old Niece: I think it was amazing all of the sets were realistic. You could hear real sounding gunshots. It was so good I'm speechless really. Fav bit when they all round the table and they poked the stick at RC and the cats came. Loved watching RC teach the animals how to go upstairs. 5 year old son Aaron: Loved the parrot. Liked the character with long tongue who eats bugs (Carmello). Was totally gripped by film. Mummy: I loved the cinematography. The colours were breathtaking. I loved the level of detail you could see every hair every feather. Loved the amount of close up shots felt like you were there. The pace of it was perfect especially with all the intense chases. The character depth and development was superb. A film with many messages and many layers. Perfect for all ages. 12 year old Niece: It was fun. Animation was brilliant. Fav character was Kiki (pretty bird) because she was always looking out for Tuesday. Fav part was being chased by cats and sliding everywhere. Great action shots. Really cool. Would pay to watch it definitely. Suitable for ages U I think. From 4 to about 10 but older can enjoy too. This is the official trailer of the movie for the UK release in May 2016. 30th April to 2nd May. We got complimentary entrance to a private screening for which we're very grateful. It does not influence this review as we truly adored the film! Thank you! How wonderful to have your own private screening, I'm sure it will be a popular film when it hits the nation. It sounds really fun, can't wait to take the kids to see it! What a brilliant review! And how nice to see it like that! Definitely on our list to see now, thank you!! The film sounds great, I and I love the way you've included the whole family's reactions to it. 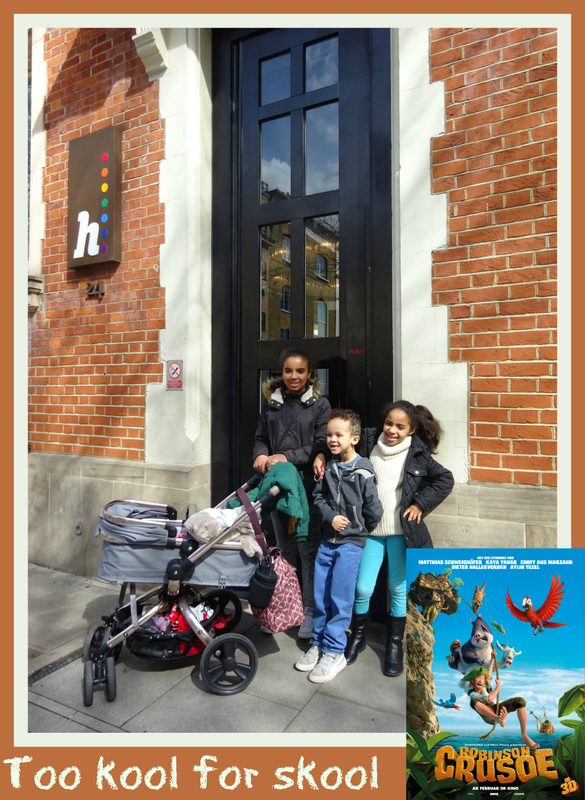 I've flagged up this post for the May BritMums arts & culture round-up! How cool to have a private screening - makes you feel so VIP! Hey! This is amazing. I read about him when I was in school. I liked going through this post. I have to share this with my friends and cousins right away. It has been a very long time that we watched anything good like this. I remember watching shows by Andy Yeatman last year.